'Thanks for your interest in our clubs, I hope that you feel comfortable and relaxed in your class as we promote a fun atmosphere and an interesting programme. We are here to help you achieve your goals.' Anthony Brennan, ABTKD Chief Instructor. 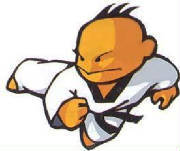 Tae Kwon-Do is a martial art originating in Korea. It combines combat techniques, self defence, sport, exercise, and in some cases meditation and philosophy. It is the most popular martial art in the world in terms of practitioners, with an estimated 70 million students worldwide. Translated from Korean, 'Tae' means to jump or kick with the foot, 'Kwon' means to block or strike with the hand and 'Do' means way as in path to follow. 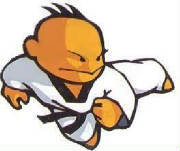 Tae Kwon-Do is a system which uses hands and feet to deliver kicks, strikes and blocks for defence of the weak, vunerable, elderly or oneself. Our clubs are members of the Tae Kwon-Do Association of Great Britain (TAGB) which is the largest single martial arts organisation in Europe, with over 25,000 members training in over 600 clubs throughout the UK. Current class times and venues are available on our website 'when & where' page. Mixed age and ability where families can train together. All you need to start with is bare feet and loose fitting clothes. Club membership is an advanced payment of £35 per four week period with a minimum of two training sessions per week. This is collected via monthly Standing Order on the date of joining. During your first month, you are required to apply for a TAGB licence via your instructor. The Tae Kwon-Do Association of Great Britain is the largest martial arts organisation in Europe; they issue a licence for your own protection and insurance. The external application fee is £45. Your licence must be renewed annually at a cost of £40. Within the first eight weeks, you are required to purchase a TAGB training suit via your instructor. This is called a ‘dobok’ and serves to unify us as an organisation while promoting a disciplined appearance. Doboks are priced at £40. After a few months, students will have the opportunity to be assessed by a TAGB grading examiner. This assessment is known as a ‘grading’. Successful students are awarded with an official certificate and a new belt. Grading is completely optional as a short term goal and available every three to six months. The external grading fee of £30 applies. As chief instructor, I will be happy to answer any questions you might have; please feel free to approach me at the club or contact me via phone or email. Please use the below link to download, print and complete a membership form and bring it with you to your free trial lesson.